An example of Ann's amazing recycled crayon jewelry available for purchase here. She advises not leaving this in a hot car or in any extreme temperatures like that, but it will stay perfectly intact with normal storage and wear. So how do you decide to make jewelry from crayons? Well, I was dying to know myself. Ann said, "I have recently seen a lot of melted crayon art on canvas and was immediately inspired. Whenever I see something I like, my first thought is 'How can I make that wearable?'. The biggest challenge was coming up with a way to create them on a small scale. I won't go into how I do it, but the process evolved through a lot of trial and error." I think the trial and error was well worth it. This is most definitely not the work of a novice. I asked Ann how long she had been making jewelry and how she got started and she told me she "started making jewelry when I was 10 yrs old. I started with fishing line, seed beads, and findings that were way too big! The older I got, the better my techniques became and the more I loved the results. I've only been good at it for a few years. Jewelry making is something I learned on my own and I didn't have anyone I could ask for helpful tips, so it took me much longer to master." And master it she has! Not only does Instinctively Indie make jewelry from crayons, they also many other fun items. Their shop is like a carnival for me! 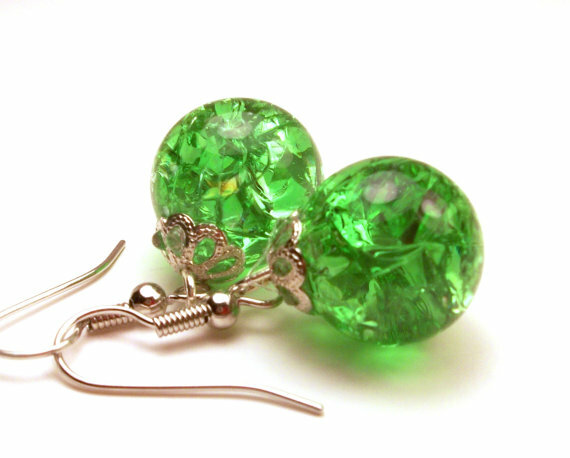 It is so bright and fun and you can find the neatest items, like the fried marble jewelry for instance. And the pretty button decorated pillboxes that Ann's mother makes. She has a fabulous eye for matching colors and textures! And beautiful handbags too! And many more things that I don't have the room to mention. You really just need to look through her shop. I asked Ann what inspired her. She said, "There are so many things in the world that have the potential to be beautiful. I am most often inspired by things that other people would throw away. I don't purchase items in perfect condition very often. Items have meaning when you've taken the time to create or refurbish them. Flea markets are my favorite places to go and find inspiration. I carry a small notebook with me and write down or sketch ideas. I often buy something and have no idea what I'm going to use it for. That item may sit around for a year or two, but it becomes the perfect solution to a design problem I have!" I just love Ann's approach. 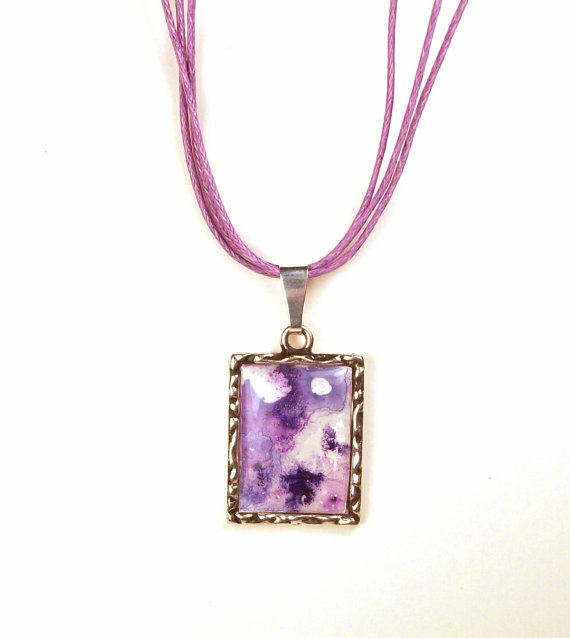 One of Ann's pieces of fried marble jewelry available for purchase here. 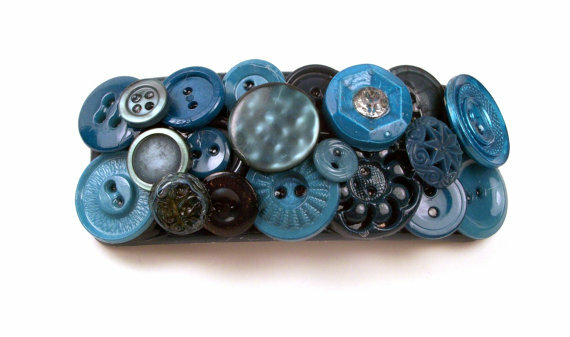 Ann's shop also has many wonderful button pieces, everything from pillboxes to jewelry, that I had to find out more. I needed to know how she started working with buttons. My enquiring little mind was on overdrive! Probably because I also have a respectable button collection. Ann told me, "My first passion is sewing. My mother made most of my clothes when I was young and taught me everything she knows. I loved going through her buttons and I've always been amazed at the detail that can be found in these tiny notions. I bought a mason jar full of them at a flea market on a whim. I had so much fun going through them. Unfortunately most of them were singles, so I didn't have much use for them in sewing. I experimented with turning them into jewelry and found it to be incredibly relaxing. I was pregnant at the time and needed to stay off my feet. When friends and family members found out about my button jewelry, I was given jar after jar of buttons as gifts. I started with one quart sized jar of buttons and now I have thousands upon thousands of them!" And they are put to good use too! Button embellished barette available for purchase here. I love that Ann's mother taught her to sew, but now Ann is "taking it to another level" and teaching her! Ann said that her mother was "also lured by the siren song of the buttons and wanted to create some things for my shop. I am constantly bouncing ideas off of her." I love when the "student" becomes the "teacher"! Please visit Ann's Facebook and Twitter and show her and her lovely mother some love! I know! I had never heard of it either, but people everywhere are loving the fried marbles. :) I was totally impressed. What a cool idea and they look beautiful!